Eating healthy is not just about the amount of food you eat. You need to make sure you’re eating the types of food that charge you up. Strive to eat meals that include fruits, vegetables, whole grains, low-fat protein, and dairy. «» Calcium builds strong bones and teeth. «» Vitamin D supports bone health. «» Potassium helps lower blood pressure. «» Dietary fiber may help you to digest your food better and feel full. «» Protein helps you grow strong and powers you up. «» Iron supports your growth. Fruits and Vegetables: Make half of your plate fruits and vegetables. Dark green, red, and orange vegetables, in particular, have high levels of the nutrients you need, such as vitamin C, calcium, and fiber. Adding spinach or romaine lettuce and tomato to your sandwich is an easy way to get more veggies in your meal. Grains: Choose whole grains, like whole-wheat bread, brown rice, and oatmeal. Protein: Power up with lean meats, like turkey on a sandwich, or chicken, seafood, eggs, beans, nuts, tofu, and other protein-rich foods. Dairy: Build strong bones with fat-free or low-fat milk products. If you cannot digest lactose (the sugar in milk that causes some people stomach pain). choose soy or rice milk and low-fat yogurt. You don’t have to stop eating these items, but eating less of them may help you maintain a healthy weight. Pizza, candy, fast food, and sodas have lots of added sugar, solid fats, and sodium. A healthy eating plan is low in these items. Added Sugars: Many foods, especially fruits, are naturally sweet. Other foods, like cookies, snack cakes, and brownies, have added sugars to make them taste better. These sugars add calories but not nutrients. Solid Fats: Fat is important. It helps your body grow and develop; it is a source of energy; and it even keeps your skin and hair healthy. But some fats are better for you than others. Solid fats are fats that are solid at room temperature, like butter, stick margarine, shortening, and lard. These fats often contain saturated and trans fats, which are high in calories and not heart healthy. Take it easy on foods like cakes, cookies, pizza, and fries, which often have a lot of solid fat. too much sodium can raise your blood pressure, which is unhealthy for your heart and your body in general. Processed foods, like those that are canned, frozen, or packaged, often have a lot of sodium. 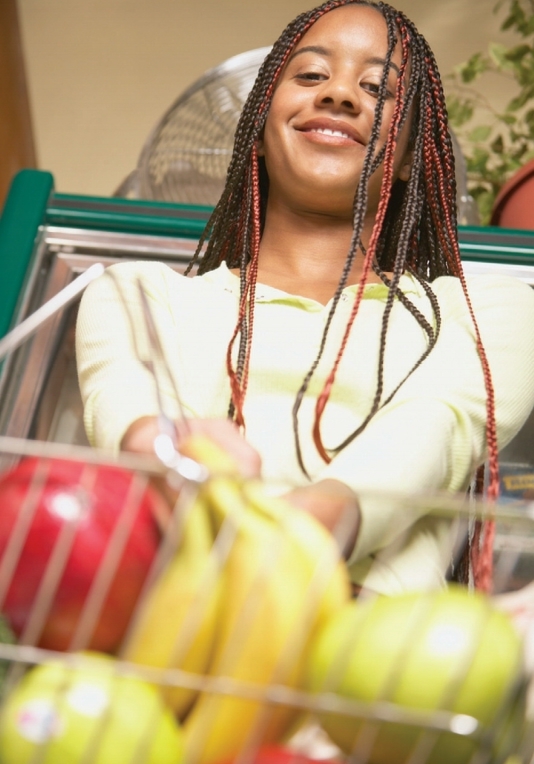 Fresh foods do not, but often cost more. If you can afford to, eat fresh foods and prepare your own low-salt meals. 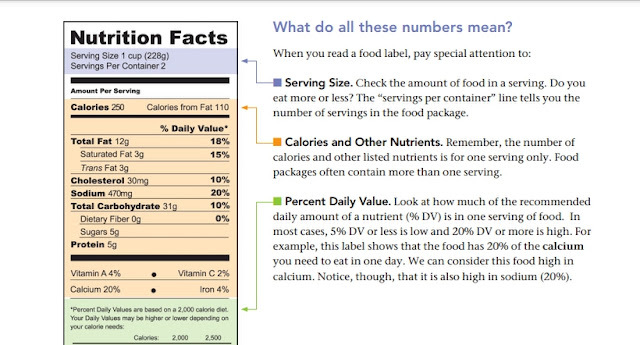 If you use packaged foods, check the amount of sodium listed on the Nutrition Facts label. (Read “What do all these numbers mean?” on the picture below.) Rinse canned vegetables to remove excess salt. Try to eat fewer than 2,300 mg of sodium per day. This equals about one teaspoon and includes salt that is already in prepared food, as well as salt you add when cooking or eating your food. Your doctor knows more about your specific needs, so don’t be afraid to ask her or him how much sodium you should be eating. ■ fresh apples, berries, or grapes. ■ a handful of walnuts or almonds. ■ a small bag of baby carrots. ■ low-fat or fat-free yogurt.